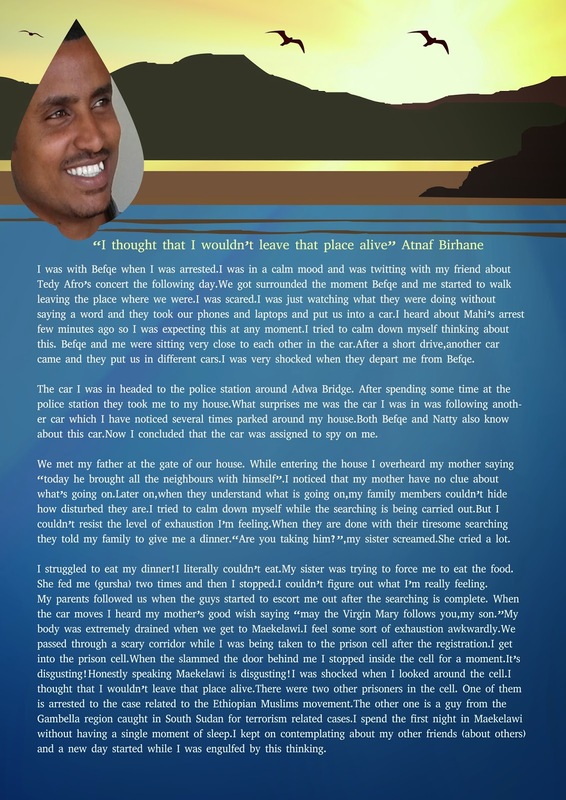 I was with Befqe when I was arrested. I was in a calm mood and was twitting with my friend about Tedy Afro’s concert the following day. We got surrounded the moment Befqe and me started to walk leaving the place where we were. I was scared. I was just watching what they were doing without saying a word and they took our phones and laptops and put us into a car. I heard about Mahi’s arrest few minutes ago so I was expecting this at any moment. I tried to calm down myself thinking about this. Befqe and me were sitting very close to each other in the car. After a short drive, another car came and they put us in different cars. I was very shocked when they depart me from Befqe. The car I was in headed to the police station around Adwa Bridge. After spending some time at the police station they took me to my house. What surprises me was the car I was in was following another car which I have noticed several times parked around my house. Both Befqe and Natty also know about this car. Now I concluded that the car was assigned to spy on me. We met my father at the gate of our house. While entering the house I overheard my mother saying “today he brought all the neighbours with himself”. I noticed that my mother have no clue about what’s going on. Later on, when they understand what is going on, my family members couldn’t hide how disturbed they are. I tried to calm down myself while the searching is being carried out. But I couldn’t resist the level of exhaustion I’m feeling. When they are done with their tiresome searching they told my family to give me a dinner. “Are you taking him?”, my sister screamed. She cried a lot. My body was extremely drained when we get to Maekelawi. I feel some sort of exhaustion awkwardly. We passed through a scary corridor while I was being taken to the prison cell after the registration. I get into the prison cell. When the slammed the door behind me I stopped inside the cell for a moment. It’s disgusting! Honestly speaking Maekelawi is disgusting! I was shocked when I looked around the cell. I thought that I wouldn’t leave that place alive. There were two other prisoners in the cell. One of them is arrested to the case related to the Ethiopian Muslims movement. The other one is a guy from the Gambella region caught in South Sudan for terrorism related cases. I spend the first night in Maekelawi without having a single moment of sleep. I kept on contemplating about my other friends (about others) and a new day started while I was engulfed by this thinking.